Throwing a graduation party is an easy way to tell that special someone that you’re proud of her accomplishments. One of the more popular decorations for the party is a photo board, complete with photos of the graduate. In addition to baby photos and school photos, you can include pictures of the graduate with her family and friends. 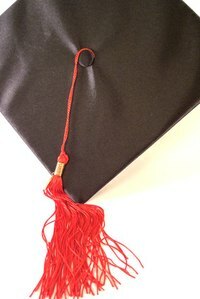 Graduation photo boards are a quick and easy decoration for your party. Create a photo board from an old door or window. Look for doors and windows with individual glass panes. Scan the photos into your computer and print out copies with your printer, either in black and white or color. This allows you to preserve the originals. Trim the excess paper from the photos and attach them to the glass panes with double sided tape. You can leave the door as-is or paint it black for a neutral background or even use one of the graduate’s school colors. If you find a door or window that’s missing several glass panes, remove the remaining glass panes. Enlarge the photos to the size of the panes, trim the excess paper and slide them into the area where the panes were. Make your own graduation photo board with a piece of plywood or even an old bulletin board. Wrap a piece of cotton batting or quilt batting to the wood and secure it in the back with a staple gun and staples. Wrap a piece of fabric around the board, securing it in the same place. Attach ribbons across the fabric, at a diagonal. Crisscross the ribbons by attaching more ribbon in the opposite direction. Glue buttons to the ribbons at each intersection. Slide the photos in between the ribbons. Craft a photo board that also lets guests leave behind a note for the graduate. Paint a large piece of plywood with white paint and set aside to dry. Print out your favorite pictures of the graduate, making the photos roughly the same size. Coat the edges of the board with decoupage glue and lay your photos on the edges to create a border around the message area. Add a layer of decoupage glue over the photos, to keep them from coming loose. Display the photo board in a common area of the party and place colored markers nearby. Ask each guest to write a note or message in the center of the board.